Comics Make Me Happy! : Ta-Da! (Or, The Results of Loopiness Brought On By Sleep Deprivation!) Now with Updates!! Ta-Da! (Or, The Results of Loopiness Brought On By Sleep Deprivation!) Now with Updates!! Regarding that bright red in J'onn J'onzz's costume. Let's take out that red and replace it with a color more analogous to green, shall we? Ignore the purple halos around the medallions, please...that was an accident. Yeah, that's right. Purple is green's analogue. 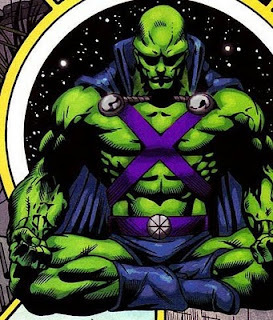 And if any male hero gets to wear purple, it's J'onn. I think I'd darken the cape and boots a bit and then I'd be happy. Now he matches my blog's color scheme! Definitely an improvement. I've done dozens of test costumes/color variations for J'Onn, and it's tricky business. I really liked him in white, but basically looked like Pulsar Stargrave, and it didn't suit a detective at all. I refused purple because those were Drax the Destroyer's colors. Well, not for many years it isn't, and it looks good on the original. That or dark blue's the way to go. Thank you. I know. It's not as easy as I thought it would be, plus I was never very good with color theory. Maybe silver straps? Like they did in the Black Lantern costume. Silver, green, dark blue might work. I'll have to start playing around with the Black Lantern costume next. Call me set in my ways, but red and green is just soo right. That said, I'll deal with changes when they come. I'm not much of a visual artist, so beggars can't be choosers, or something. You know, m.c., if they actually do get rid of the red, I'll probably wing up being the first one to cry foul, because I'll wind up missing it only after it's gone. I honestly can't make up my mind about what exactly his costume should look like--just no full bodysuit (and no conehead) is all I'm set on. I'm usually the guy who says, "make so-and-so's costume a darker shade." Green's just tough to compliment, I think. That's why I like the GL costume--they compliment green with "non-colors," black and white. So sharp.